Manufacturer of a wide range of products which include shiny stamp kit 100, shiny handy stamp, colop dater stamps, colop stamp ink, colop stamps and trodat self ink stamp. We are the leading company feel immense pleasure to offer our Shiny Stamp Kit 100 & 200 to our respected customers. The kit is integrated with all parts to make your own stamp immediately. It is very affordable and can be used in urgency appears. 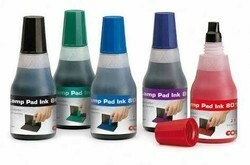 Imported handy stamps with best quality stamp pad and ink also.use as a Gift Stamp also. We have "Trodat self ink dater " product which export in other country & available of all products at our office at Ahmedabad.